Location: Cabanas Village, Cabanas de Tavira. Construction: approx 45m2, (excluding terrace of 21m2 & roof terrace of 30m2) built in 1998. 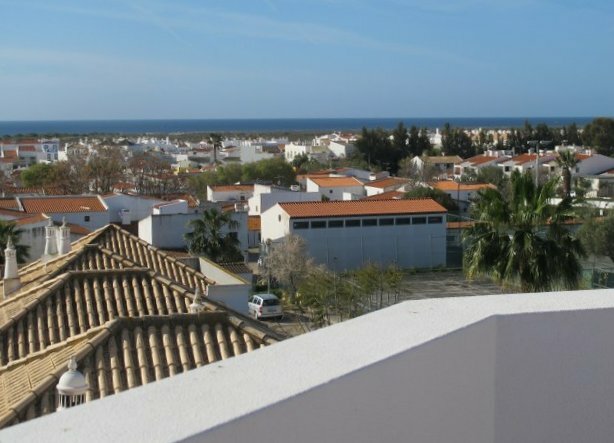 Light and bright top floor apartment in Cabanas de Tavira with large, south facing private terraces close to the beach and various golf courses. This "home away from home" with communal pool is centrally located with all amenities within walking distance. A car is recommended but not essential. The train, boat, taxi and bus are all within a 10 minutes walk. The nearest supermarket for fresh bread, fruit and milk just a 3 minutes walk. Cabanas is a former fishing village, about 3 Km from Tavira to the East side, which is known for its beautiful and clean beaches (Blue Flag) and friendly atmosphere. The waterfront has recently been renovated and you can walk all along the lagoon passing shops, bars and excellent restaurants facing the Ria Formosa Nature Park. To get to the beach you need to take a 3 minute boat ride to pass the lagoon. Over the boardwalk you get to a kilometers long stretch of white sandy beach, only busy in summer. There are several beaches and golf courses within a few minutes drive and the town center of Tavira is only 5 minutes drive away. The apartment is located in the heart of Cabanas, in a beautiful and tranquil urbanization called Cabanas Village, which is built like a small village within a village. The accommodation has a Mediterranean ambiance and is situated on the 2nd (top) floor and is composed of a hallway with storage facilities leading to the living room with dining area and fully equipped open plan kitchen, a double bedroom with built-in wardrobe, a bathroom with shower and two large (21m2 & 30m2) south facing terraces. The apartment and the communal pool are surrounded by beautiful and mature gardens. During summer there is a pool bar that serves refreshments, snacks, excellent cocktails and ice-creams. The swimming pool may be used free of charge by the owners and their guests only and you can even have breakfast or dinner next to the pool. The apartment is fitted with air conditioning in the bedroom, satellite TV (bbc world news, euro news, 1 dutch, 1 spanish, 1 french and 1 german channel) and a DVD player. Suitable for winter letting. No smoking allowed inside the apartment and pets are only allowed after written confirmation from the property management agent. There is plenty of parking space for your car and bicycles can also be rented nearby. Distances: Faro: 32 km; Spain: 28 km; nearest golf course (Benamor): 500 mtr; Beach: 600 mtr; nearest restaurant: 50 mtr; Supermarket: 100 mtr; Train station: 300 mtr; Tavira town center: 3 km. This property has free WIFI hotspot to connect to the internet, free of charge. Prices are per week. Final cleaning included. Minimum stay one week. Surcharge applicable for shorter stays.